Hello my name is Thomas Marquis, a Life Scout from Troop 138. I am working on my Eagle Scout project, Outdoor Stations of the Cross. It will be constructed at St. Francis of Assisi Parish in Triangle, Virginia, next to the labyrinth. I'll be using the following materials for my project: faux stone columns, faux stone caps, St. Bertucci outdoor aluminum Stations of the Cross plate pictures, description plates, sponsor plates, and miscellaneous supplies. The total estimated cost of the project is $10,240. As of 28 August, I have raised just under $5,000 towards my goal and sold 22 out of 32 available sponsorships. To reach my goal I am asking for donations and people willing to sponsor a station or the arbor entry way for $250 (crucifix sponsorships are now allocated). A plaque will be affixed to each sponsored location with your special message. Please contact me if you have any questions. Payments can be made in cash, check or credit card. Please contact me through the "Contact our Troop" link at the top menu bar of this web page. Thank you. See the attachments below for graphics of the project and a sponsorship form. 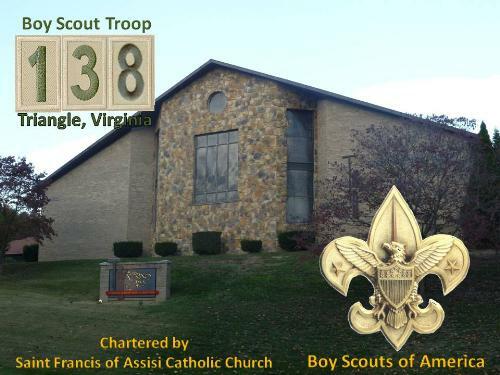 Boy Scout Troop 138 is proudly chartered by St. Francis of Assisi church since late 2015. St Francis had been seeking the formation of a Boy Scout Troop for many years and is pleased to support a great bunch of boys. Check out our upcoming outings and service project activities below! If you are interested in joining us, please contact our Committee Chair, Mrs. Chanel Marquis, by using the "Contact Our Troop" link on the top menu bar, for more information about the Troop program, meeting times, membership application, etc. In July of 2015, National BSA headquarters and related BSA governing bodies have resolved to allow Homosexual Leaders in the Boy Scout program. The ruling, however, allows and supports religious organizations that charter Scout units to establish their own membership policies with regard to this issue so as not to violate their religious beliefs. ALL Catholic sponsored Scout units in the Diocese of Arlington - as directed by the Bishop - must have their direct contact leaders (leaders who are in direct contact with youth) agree in writing that they will comply with Catholic Canon Law with respect to homosexuality and the Scout program. As a general rule, all matters of sexuality - of any variety - are considered by Troop 138 to be personal and sacramental family matters which are not appropriate to be discussed or displayed in the Scouting venue - without exception. Troop 138's safety mission is to ensure every boy is safe at all times using "sweet sixteen", with application of informed mature adult supervision and sound risk management per BSA Guide to Safe Scouting (attached) and BSA policy. To that end, one of our trained leaders is Wilderness First Aid certified (with AED/CPR) and another Scout Master is Paddle Craft safety certified. Scout Masters and other adults have also completed other BSA safety related training such as Safety Afloat. Last, but not least, is to install (via the Boy-led Patrol method) a culture of safety amongst the boys where they instinctively follow the Scout Law, Scout Oath and Scout Motto at all times. This, a culture that will accompany him into manhood, preparing him for foreseen and unforeseen hazards part and parcel with life.